Every week at the end of worship, I walk to the back of the worship area and after the last song I say, “Go in peace. Serve the Lord.” The congregation responds, “Thanks be to God.” I have said those words over a thousand times in a variety of settings. I believe in the power of those words, that the congregation is sent into God’s world to be God’s ambassadors of light, hope and love. I proclaim the words with enthusiasm and hope. Last week I was at our Synod Assembly, where representatives of the 115 congregations of the Saint Paul Area Synod of the ELCA gathered to do the business of the church and to reflect together on what it means to Live Lutheran. We started with worship and at the end I heard the words again, “Go in peace. Serve the Lord.” Of course, we were going “nowhere,” but remaining at our table and chairs for the Assembly. The oddity of the phrase triggered deeper reflection on the words, especially the idea of going in peace. Peace in the Biblical sense is wholeness or fullness. The Hebrew word for peace, shalom, means that you have everything you need to be whole in your relationship with God, neighbor and self. To “go in peace,” means the worship has filled your cup of blessing and you leave worship whole and empowered to serve. However in our culture, peace often simply means the absence of struggle or conflict. We are often use peace for a sense of calm and almost passivity. 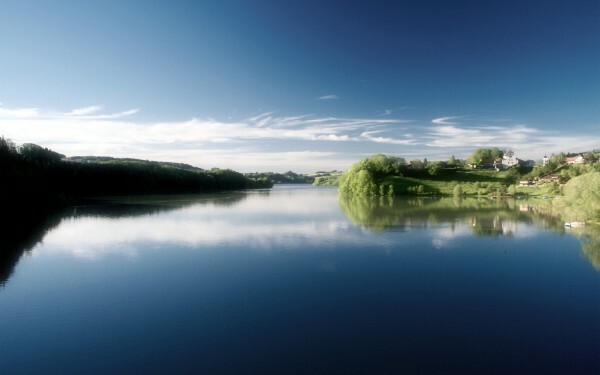 A peaceful lake is calm and tranquil. There are times in our lives when each of us needs a place of tranquil peace. But such peaceful waters have the danger of becoming stagnant and dead if no outflow occurs. I wonder if the word “peace” communicates what God truly wants from us? Could it be that instead of going in “peace,” God would want us at times to go with PASSION, the fullness of God pushing us out the door to serve with passion, energy and conviction? The energy and life of a cascading river might be a better picture of what God call us to be in the world. God’s peace is not passivity but passion. Go with passion. Serve the Lord. Lord Jesus, energize my soul with your power and grace to serve you and your world. This entry was posted in Lutheran, service, worship and tagged passion, peace, sending on May 21, 2012 by Pastor John Keller. One of my winter classes emphasized the importance of finding our passion in order to successfully become volunteer leaders. Our discussions and homework led me to do a lot of soul searching. It is how I found the Volunteer Coordinator role to fit my passion. Wouldn’t it be exciting if everyone in our congregation knew and utilized their passion(s) to select their volunteer roles?